K'omoks Territory: East central Vancouver Island and adjacent mainland. 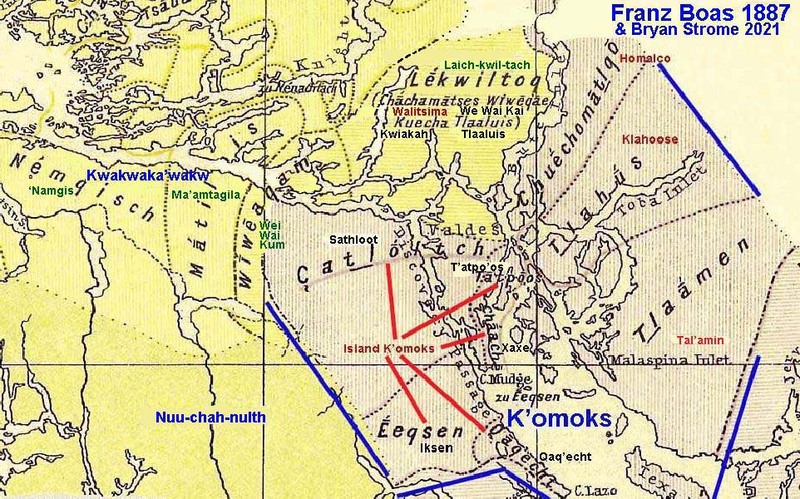 Franz Boas's 1887 map, linked to above, indicates the original territory of the K'omoks. However, when Captain George Vancouver briefly met the K'omoks at Cape Mudge on the southern end of Quadra Island in 1792, he would have had no concept of whom he was meeting nor their territory. Thence, it was only in 1842, that the K'omoks crossed into sustained "contact" and entered the historical era. In the fifty years in between, their northern neighbours, the Laich-kwil-tach Kwakwaka'wakw, had been agressively pursuing a policy of war and conflict. They had occupied the northern part of Vancouver Island K'omoks territories and were steadily advancing down the island. Intermarriges occurred. The Laich-kwil-tach were also conducting naval raids far to the south. These events occurred outside the realm of European influence. Significantly, it was only in 1850, that the Laich-kwil-tach finally "took over" the K'omoks with raids in the Courtenay area. Given the mandate of First Nations Seeker to recreate North America at the time of "First Contact", the boundary between the K'omoks and Laich-kwil-tach Kwakwaka'wakw on Vancouver Island has been fixed at it's 1842 location.